Ah and Madzia? 😉 your hatred towards peanut butter should evaporate 😉 it added spectacular flavour to the chicken. I can’t emphasize how good this recipe is. Easy and abso – f-lutely fantastic! In a small bowl, stir together the soy sauce, peanut butter, vinegar, and cayenne pepper. Set aside. Reduce heat to medium, and add everything cut into strips: green onion, broccoli, peppers, peanuts, and the peanut butter mixture. 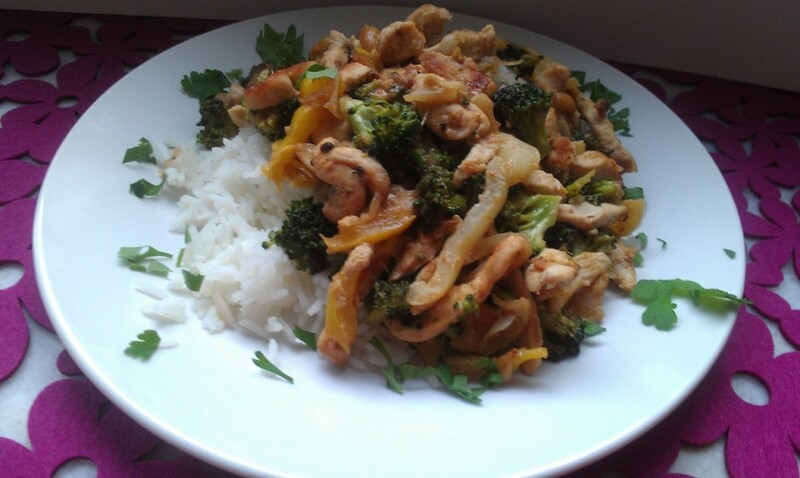 Cook, stirring often, until broccoli is tender, and chicken is cooked through. It might be too dry, then add some water or soy sauce if you think dish is not salty enough. And until next time, take care of yourself, and each other! P.S.Cookies statement about the dish: 9.5 out of 10 the smorgasbord of tastes per spoonful in my mouth was rather outlandish.